What: All market goats (dairy or meat) must be tagged in order to be shown at fair. The 4H member or FFA member does not have to be present. Who: Any 4H member or FFA member who is taking a market goat project. 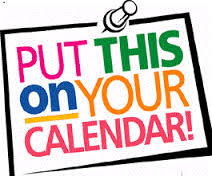 Who: Anyone interested in learning more about goats, those who wish to enter the "Rate Of Gain" contest (NOT limited to B&R animals), all market goat projects (dairy or meat) for the Butler County Fair, or if you'd just like some concession food! See the flyer for more details. ​Who:​ Anyone who has market wethers (not limited to B&R registered wethers), breeding stock or show animals registered with the ABGA​. 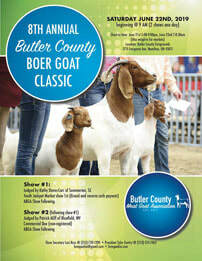 See the 8th Annual Boer Goat Classic Show flyer for more details.